As a journalist as well as a darling daughter to my former scientist mother, I keep hearing the command - INVEST IN YOURSELF. I am sure you all must be familiar with it. But not all of us agree to walk out of our comfort zones to invest in ourselves - be it honing up our skills or be it taking up more on our platter or for that matter groom ourselves as a better person. Coming from a quaint little town Ambasamudram in Tirunelveli, Tamil Nadu, Lakshmi completed her Bachelor's in engineering and now she is preparing for GATE exams. is where I spent my childhood. Her aim, she says is to get into a job at a Public Sector Unit. "While I was pursuing my Bachelors in Engineering - Computer Science, I faced a lot of challenges, not as a woman, but as a woman learning to be technology savvy. I used to be in self-doubt. I am a small-town girl and I wasn't sure if I would be able to face the very competitive world. And that is when my friends and my twin sister Thirumalai Devi Ramya motivated me to look beyond the degrees and invest in myself. That's when I learnt about Udacity and completed Front-end web developer Nanodegree from Udacity. I not only got a chance to get enrolled through a Google-India Scholarship, but also was an awarded a Badge of Excellence in the first few months! That was the turning point in my life- My Aha Moment! This was when I was in final year of college. Side-by-side I also learnt about Digital Marketing from Google. And I began exploring various online platforms like Udemy, Khan Academy, EDX, Fair & Lovely career Foundation, SkillShare, etc and have taken up various online courses over the years," Lakshmi goes on non-stop, surprising me with every new detail! She also informs that though she got at on-campus placement as a web developer, when she was in college, she gave up the lucrative job offer to hone up her skills via various online courses! Such is the hunger to learn in this young girl that despite being very fluent in English, she also took up an English Pronunciation Online Course, to get rid off what she calls the "South Indian English accent!" So much in so little time? "Mahima Ma'am, in due course of time I have learnt that time investment in our selves is the biggest investment. And it is all based upon the preferences we make. And I also believe in hearing to the inner voice, which never misguides. So whenever I go off track, the inner voice pulls me back into the grind. And then I have Mom and Ramya to help me raise the bar!" 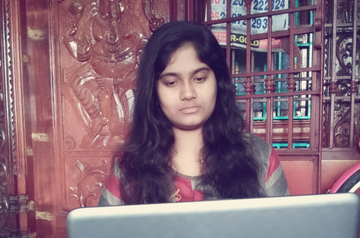 tells me a giggling Lakshmi, who is right now doing some three online courses side-by-side. Daughter of teacher parents, Lakshmi says she has no hindrance or challenges as far as studying more is concerned, in any form she likes. Then why not classroom education? Why choose online courses? "In this technology-driven era, online courses have come as a boon, since we can pursue more than one or two courses at the same time," says a very sorted Lakshmi. So what about the upcoming challenges as a techie? I tell her women are not so welcomed by the tech-industry. She smiles with determination and says, " Every field has its own share of discrimination. I haven't faced any so far, so why stop myself? Let's face it and be a generation of young women who create a niche for themselves in this challenging yet full-of-opportunities world of technology." And she says she gets more courage from SHEROES, its founder Sairee Chahal and its various community members, "One day I was going through my LinkedIn feed. I came across a post made by its founder Sairee Chahal. The name SHEROES stayed with me, with an impact. I searched SHEROES on Google, read about it and joined the awesome platform. Women at SHEROES emanate so much positivity. And I look up to them, especially my mood is down. Women sharing their experiences, motivating others, appreciating others' work - it is such a beautiful and inspiring world. SHEROES has made my world more beautiful." So what's your message to young girls, who dream like you but not get many opportunities like you, Lakshmi? "Ma'am many young women I denied wings to chase their dreams. Some parts of the world including India lack in basic education. Thus, the government, as well as volunteers, must focus on generating awareness about education and its benefits first. And then as far as flying high is concerned, learning is a never-ending process. Women who wish to grow must join the 'Career and Exams Community' at SHEROES which has played a major role in upgrading my life. Here I would like to thank the Community Moderator Nidhi Thawal mam, every word of hers each passing day, opens up a new motivation, a new opportunity to me. And I am sure it will do the same for others," says a shy yet assertive voice of Lakshmi. Lakshmi also says that she feels bad women have to make a choice between a career and family. But then she asserts," No one can take away 30 minutes from your life, just invest in yourself for thirty minutes. Start with 10, go up to 30 minutes. Up-skill yourself, in your passion. And see the life unfold in a beautiful way. Doesn't matter if you are a career-oriented lady or a home manager, these 30 minutes are a must for us all, to make us feel better, stronger. God has given us just one life, LET'S LOVE IT, LIVE IT and CONQUER IT!" Such a tender age, and such wise words. Isn't it? And I tell her," Lakshmi send me the link for taking up a Digital Marketing Online Course through Google, I wish to register myself!" She laughs with joy, promises to send that and signs off on a bubbly note saying," Ma'am, I am too young to leave a heavy message, so let me leave you with who MAREESWARI LAKSHMI is at heart! Mareeswari is a young girl, chasing her dreams. Her hobbies are singing, writing blogs; she is a big fan of Mahendra Singh Dhoni! Her inspirations in the tech world are Jackma of Alibaba and the late Steve Jobs of Apple." And she leaves me elated with a song in Carnatic Music (she finds time to even take daily classes for the same!! Wohoooo!!) I am sure your heart is singing along reading #HerStory. So do share this interview and let's motivate more and more people to INVEST IN THEMSELVES. Don't forget to leave love for her in the comments column. Wow!! Hats off to your dedication!! I am motivated too to invest in myself at least grab those 30 mins mentioned by you!! Thank you all for your kind words.. feeling blessed to be a part of this community. Maheshwari. U are awesome. So. Proud to know you. Such an inspiring girl you are. You make me want to get up and start working harder. We need girls like you and am happy to know you..
Hey @Mareeswari Lakshmi u Rock girl.Love u.Best of luck for a bright career ahead. Mareeswari Lakshmi, proud of you. Keep rocking. A real inspiration to everyone. You have discovered a winning formula early on Mareeswari. Keep shining and inspire other girls/ women to invest in themselves! You are showing the way. Shine on! Waah..!! What to say.. Very appreciable.. All the best for ur bright future..!! N keep it up..!! Loads of love..,!! Kudos to you,dear Lakshmi.The level of thinking that you have at such an young age is just amazing. Not only on self improvement, she shares and explores views on work life balance, faltering & depression etc. With roughly two months for Gate , I wish you all the best.